Are you planning a New Years Eve party? 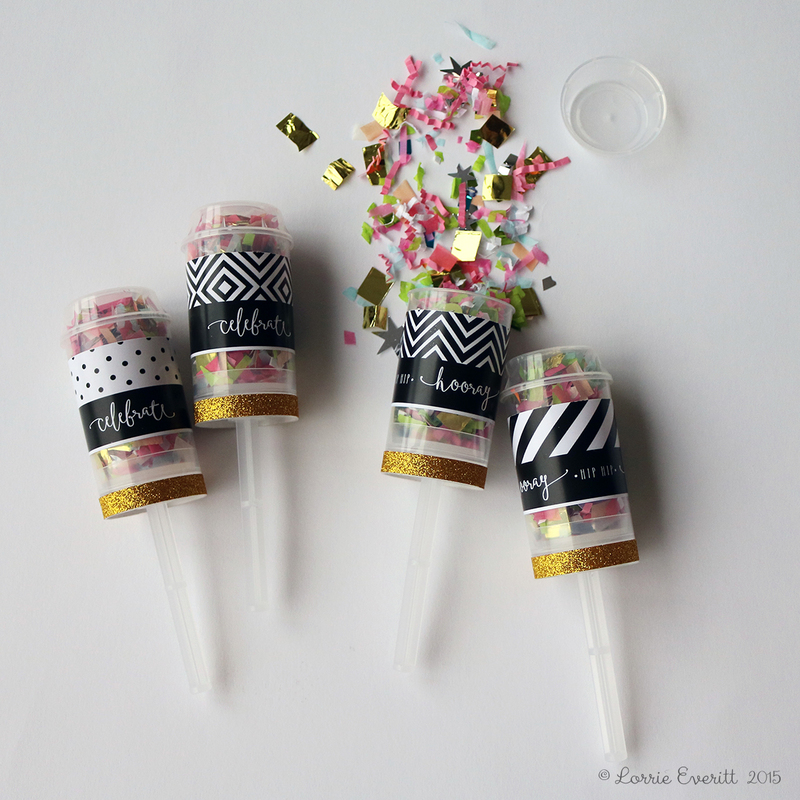 Here's a quick project that you can make in no time using push pop containers, confetti and labels that you can print at home using the free download that I created in this blog post. 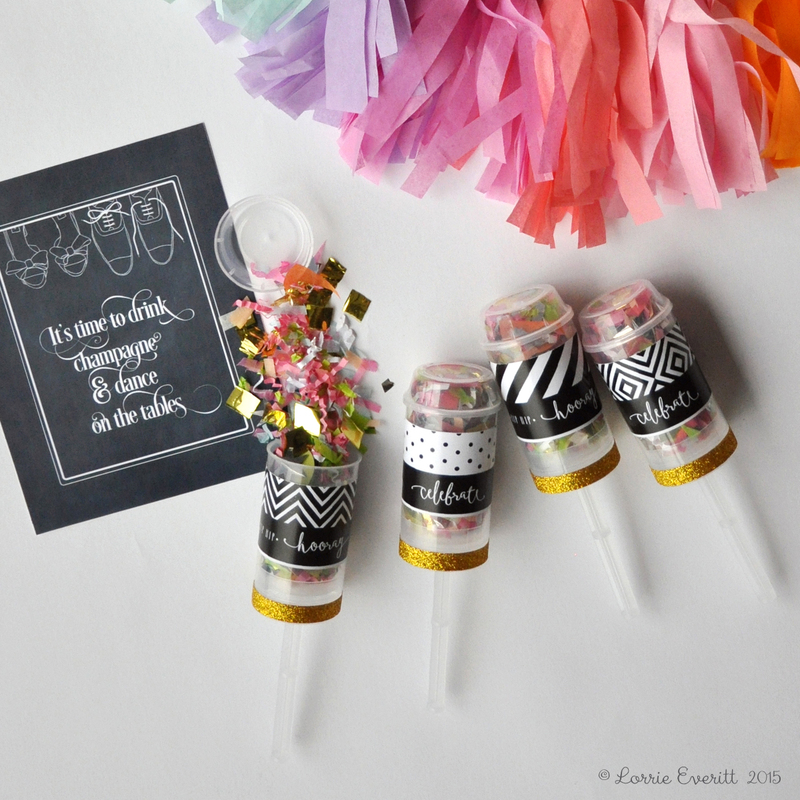 push pop containers, my sticker download, full page sticker sheets, glitter tape and confetti. You will also need a printer and scissors. Go Green! 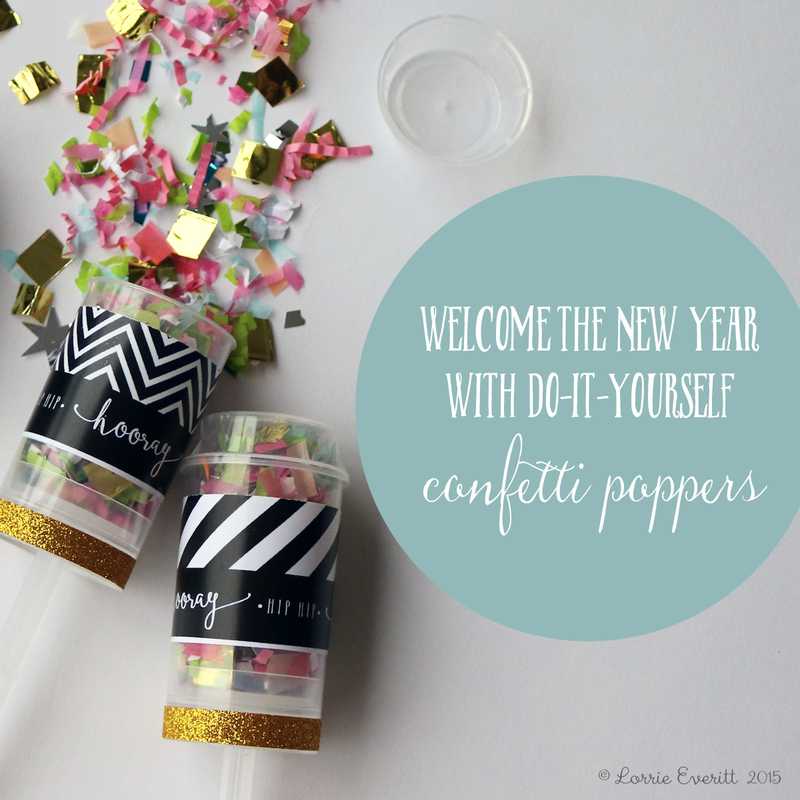 You can make your own confetti using scraps of tissue paper, mylar, sizzle and paper! 1. Assemble your push pop containers. 2. Fill the containers with confetti and add the lids. 3. Download the art for the labels. 4. Print the labels, cut them out and adhere them to the push pop containers using my photos as a guide. 5. 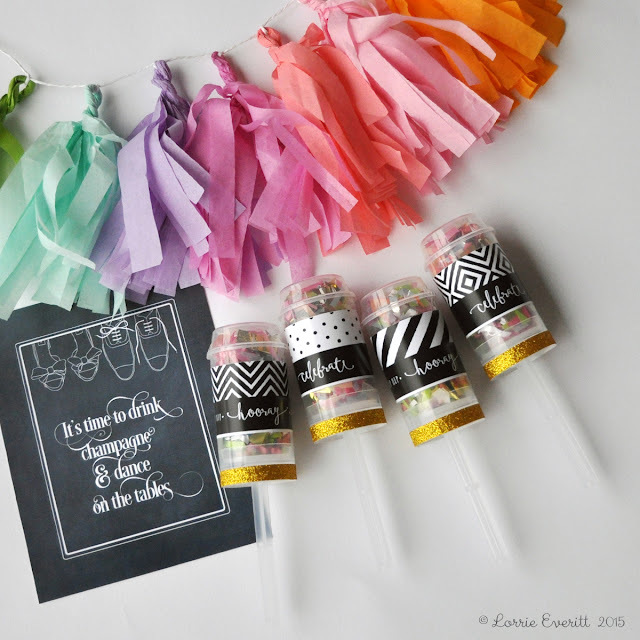 Add a little sparkle with some glitter tape and you are done! 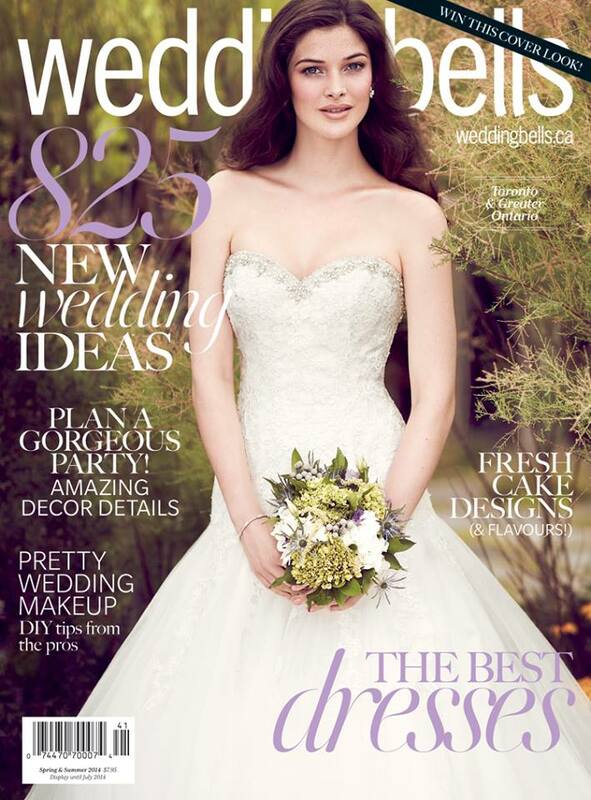 Hand these out to your guests just before midnight, grab your camera and get ready to take some amazing pictures. 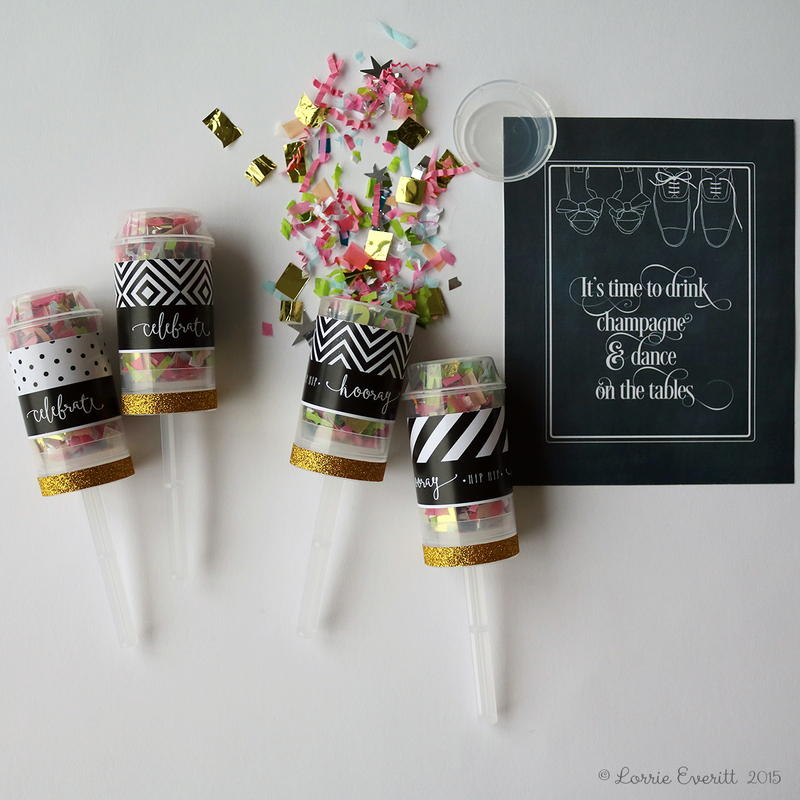 FYI : Have your guests remove the push pop lids before pushing the confetti out of the containers. Last year my husband's Grandmother asked me to take some photos of her with all of her grand and great grand children when we were together for the holidays. She knows that I always have my camera on hand and love to take photos. 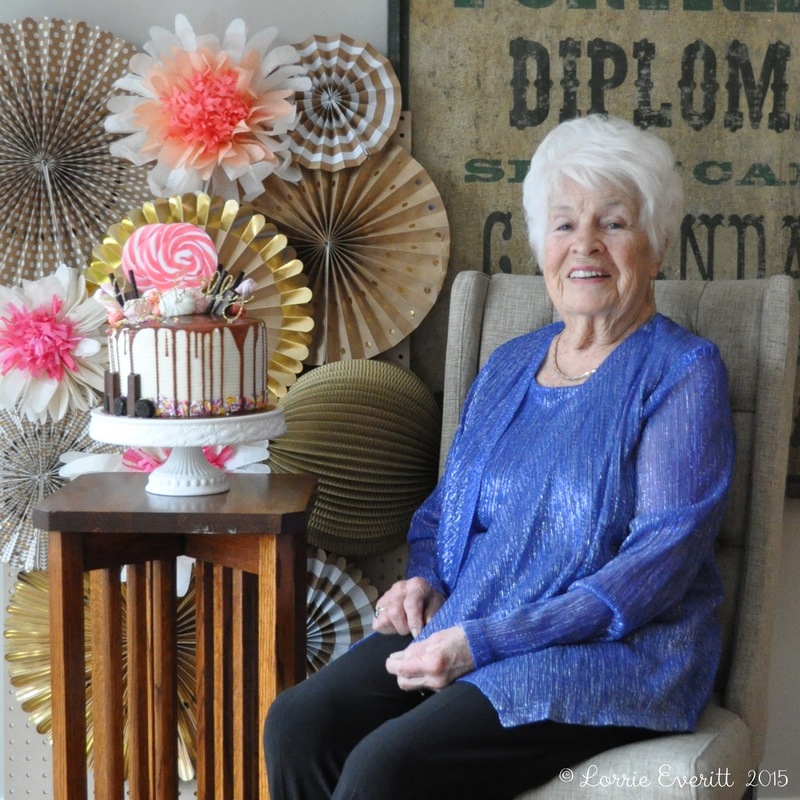 We celebrated Grandma's 99th birthday this weekend and I decided to surprise her by setting up a photo backdrop in my kitchen so I could photograph her with everyone at the party. I knew that the natural light in the kitchen would be the best spot to photograph at the time of day that I would be shooting. I made an assortment of paper and tissue paper elements to hang as a backdrop and hung some paper lanterns. I was going to cover up my vintage sign with a canvas drop sheet but I liked the look of it with the paper decorations and it became part of the set up. 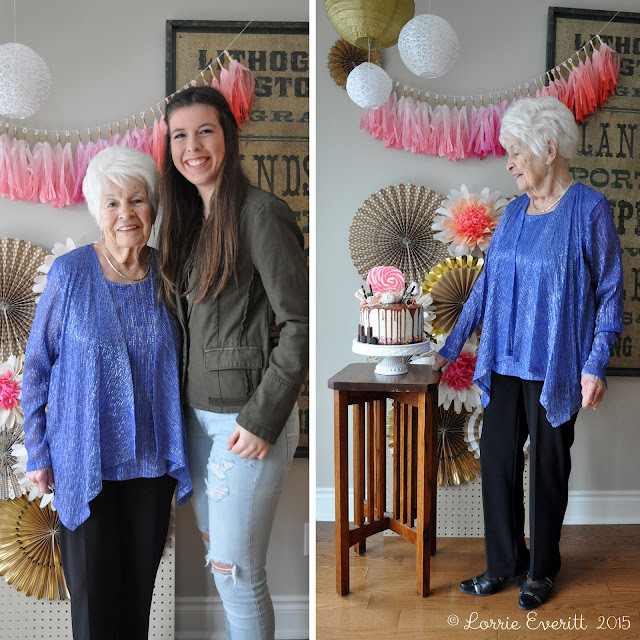 I used a chair and a small table with Grandma's birthday cake as props. 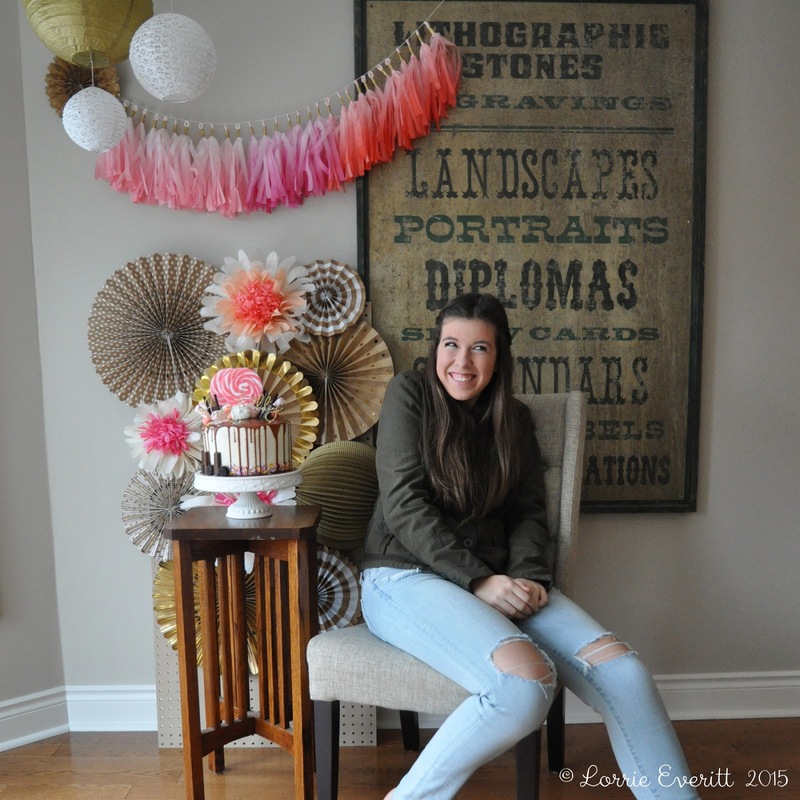 I tested the set up with my daughter before the birthday guests arrived to make sure that back drop was going to work for both sitting and standing. Grandma loved the photo backdrop and was so happy to have her photo taken with everyone. We had a lot of fun taking the photos and you can tell from all of the smiles when you look at the pictures. A little later in the day, I surprised Grandma again by presenting her with a gallery frame filled with photos that I had just shot and printed at home. 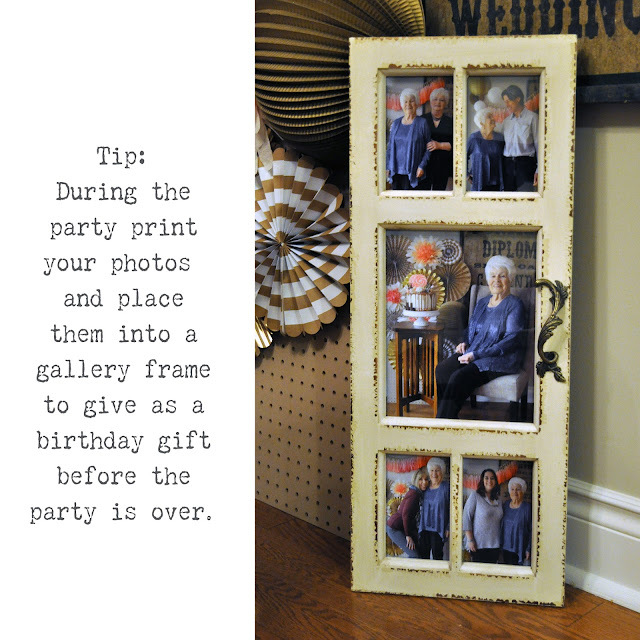 She left the party with not just memories of the day but something that she could hang in her home right away. 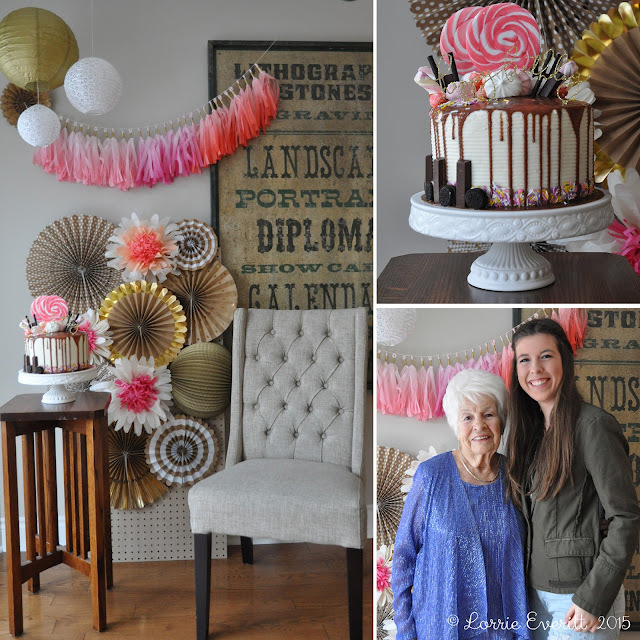 This diy concept is a fun idea for more than just birthday parties! 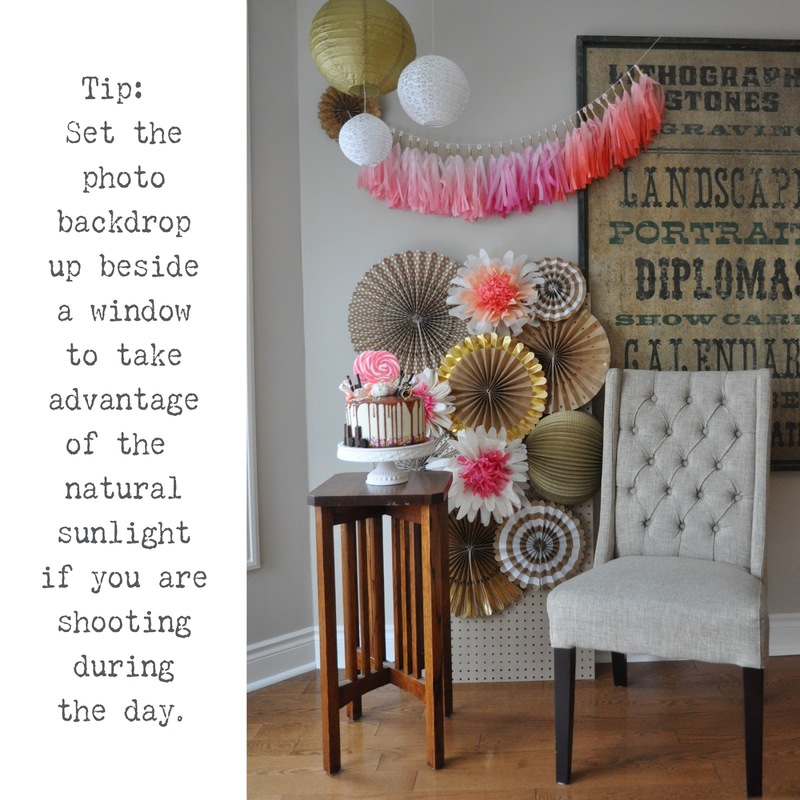 I would do this for a baby or bridal shower, wedding or anniversary party and of course, during the holidays. The best part for me was being able to print the photos right away so I could frame them and present them as our gift. 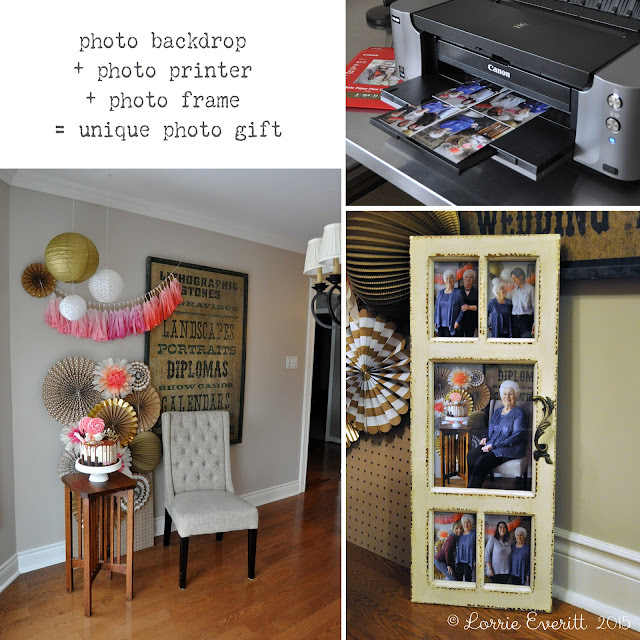 I really like that my Canon Pixma Pro-100 photo printer can print photos up to 13" x 19" because I can purchase almost any frame that I want and I know that I won't have to worry about the photo size. and here's a close up of the birthday cake that I decorated and used as a "prop" in some of the photos. I hope that you have the opportunity to take lots of photos in the next few days with your family and friends. Are you ready for the holidays? The countdown is on! My cards are in the mail, I've started gift wrapping many of our gifts and I can't wait to start my holiday baking this weekend. 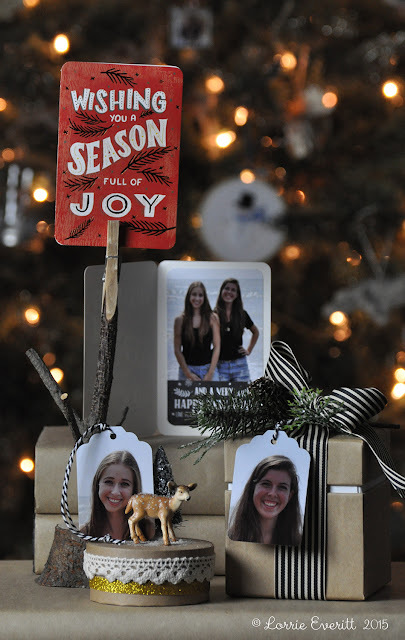 I take photos of my family all year round and for the past 21 years I have tried to incorporate a few of my favourite photos into my holiday crafting projects. Today I'm going to share with you a couple of the things that I did with my photos this year. I shot photos of my daughters on the beach of Lake Erie this summer and I was originally planning to use one of the pictures on the front of our Christmas cards as I always do. But I ended up doing something a little different this year. 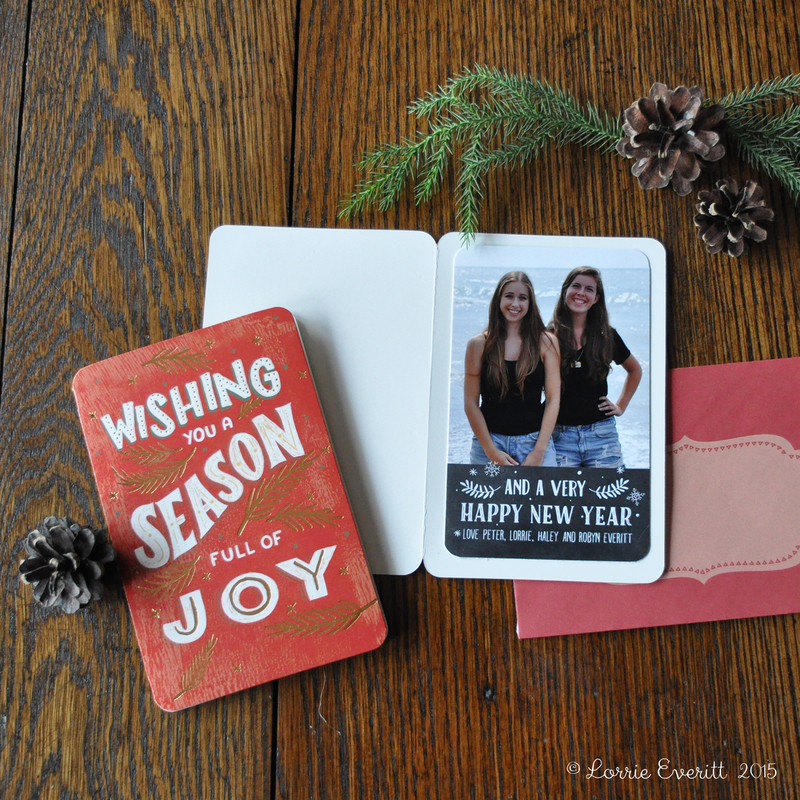 I purchased these holiday cards and personalized them on the inside with my photos. 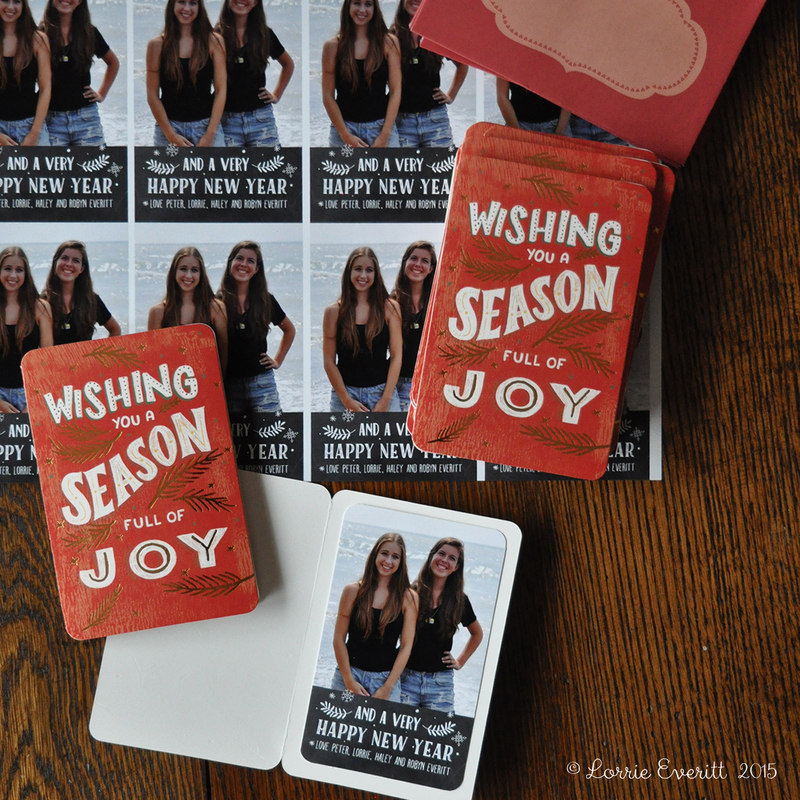 I cropped and re sized my photo to fit the inside of my cards and added a holiday message using Photoshop. I didn't have a lot of spare time to make my cards so I printed my photos at home on my Canon PIXMA Pro-100. I love my photo printer because the photos look like they were professionally printed and I know that the colours won't fade over time. I set up my photos so I could print twelve at a time on 13"x19" sheets of photo paper. 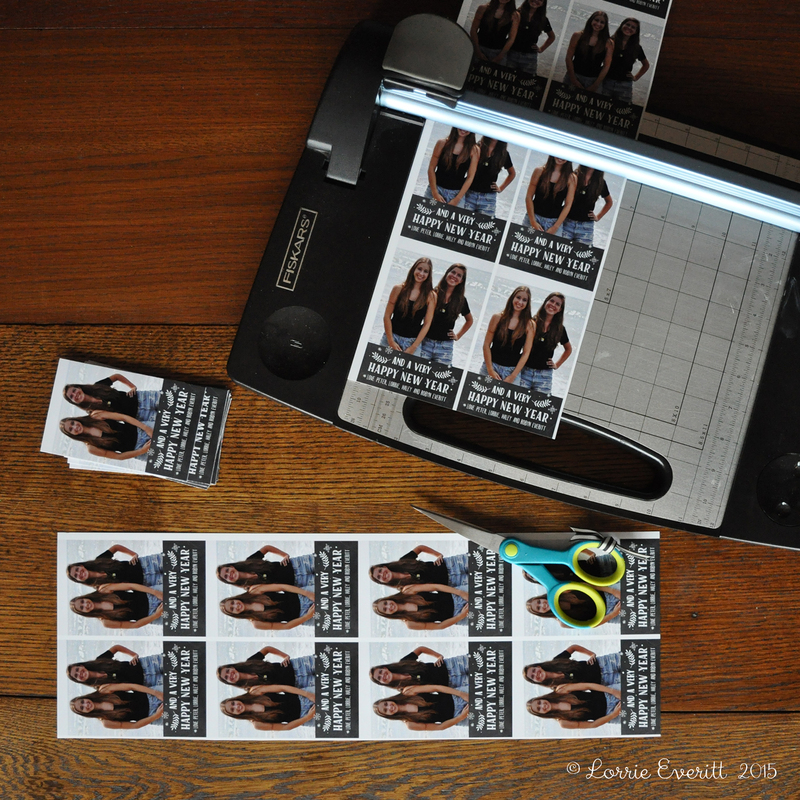 I cut the photos out using my large paper cutter. You could use scissors to trim your pictures but a paper cutter is quicker and your finished photos look more professional. My premade Christmas cards had rounded corners so I used the Crop-a-dile corner chomper to round the corners on my photos as well. I really like this corner cropping tool because it allows me to crop four or five pieces of paper at a time. 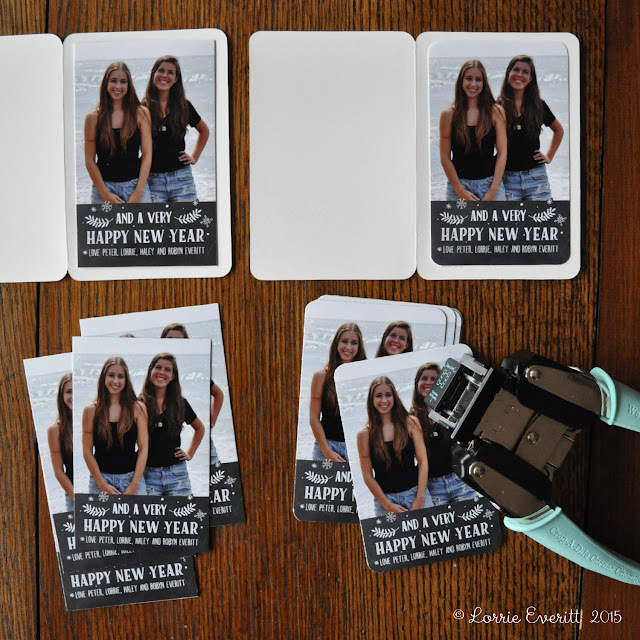 I use glue dots to attach my photos to the cards. And there you go! I personalized 80 cards in just a couple of hours! I've created these for my family gift for many years. I like to number the backs of my daughters' photo gift cards so they have to open their gifts in the order of the tags. It makes Christmas morning a little more fun as we watch them hunt for which present to open next. 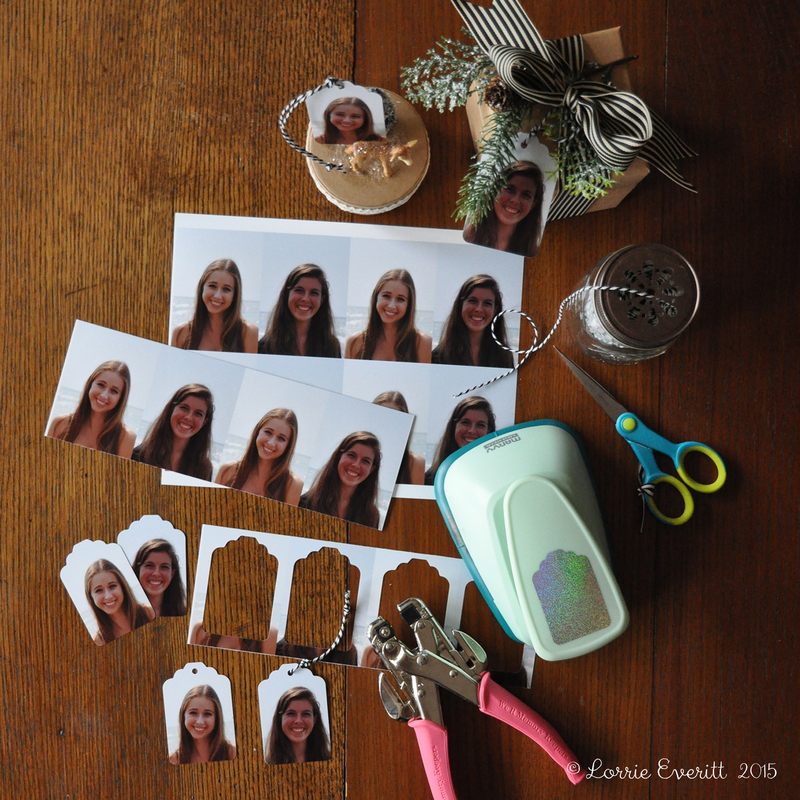 For this project I sized and cropped my photos in Photoshop to fit my tag shaped paper punch. I printed them on my PIXMA Pro-100 photo printer at home so I would have better control of my picture size for this project. 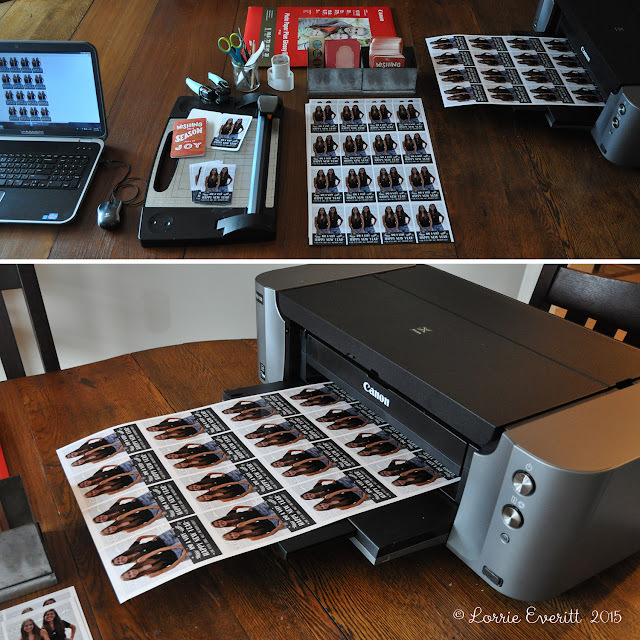 I was able to print eight tags at once using 8.5"x11" sheets of photo paper. I like to add baker's twine to my gift tags so I added a hole to each tag using this single hole punch. Here's a close up of one of my gift tags on a small kraft gift box that I embellished with lace and gold glitter tape, a deer figurine and a mini bottle brush tree. Stay tuned ... I have a few other projects that I'm working on for the holidays! 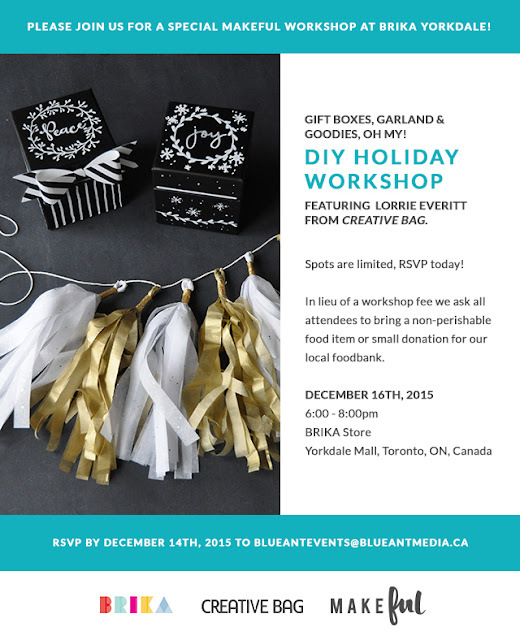 Join me for a Special Makeful Workshop at BRIKA Yorkdale next week. I'd like to personally invite you to attend a special Makeful Workshop at BRIKA Yorkdale on Wednesday December 16th from 6 to 8pm. I know that this can be a busy time of year but you deserve to treat yourself. What could be better than spending a couple of stress free hours crafting with me?! 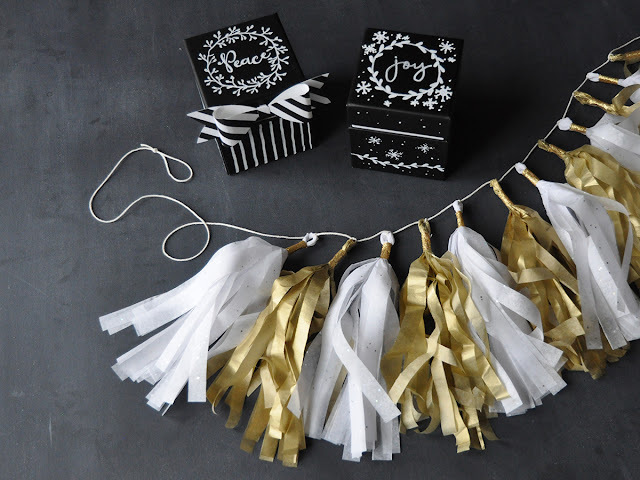 I'm going to show you how to use chalk markers so you can personalize a gift box and we'll create a festive tissue paper tassel garland that might inspire you to host a New Year's eve party ... even if it's just a party for two! If you have not been to the BRIKA pop up shop in the Yorkdale Mall you are going to love it - trust me. It's full of amazing handmade items and the Makeful learning studio in the back of the store is a crafter's dream space. 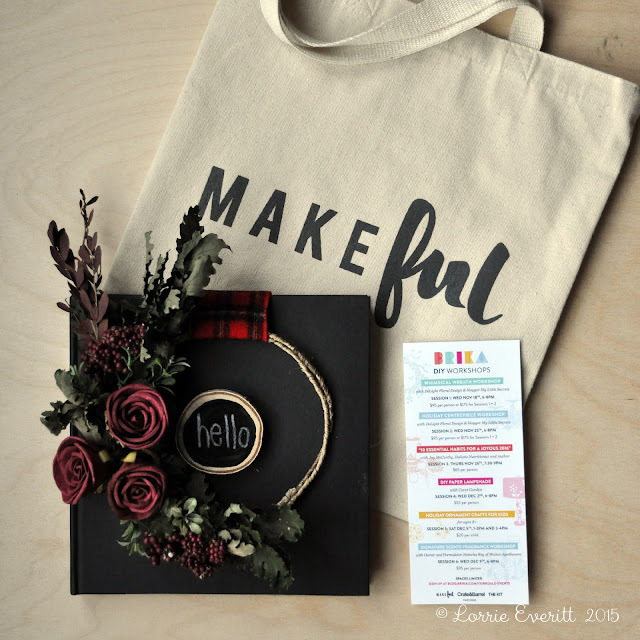 My crafty friends already know about Makeful - it's a new TV channel celebrating the creativity within all of us and it's in free preview right now. Makeful's programming combines food, design, DIY & style shows. I'm really happy that In lieu of a workshop fee we're asking everyone to bring a non-perishable food item or small donation for the local foodbank. I hope to see you on Wednesday! It's going to be fun. It's my favourite time of the year .... wrapping season! I have been asked many times if I am a "professional gift wrapper" and I always laugh and say "no". 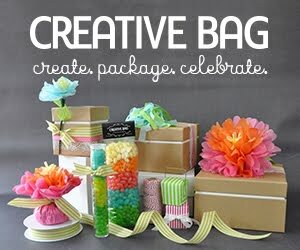 But I do like gift wrapping and designing packaging products. 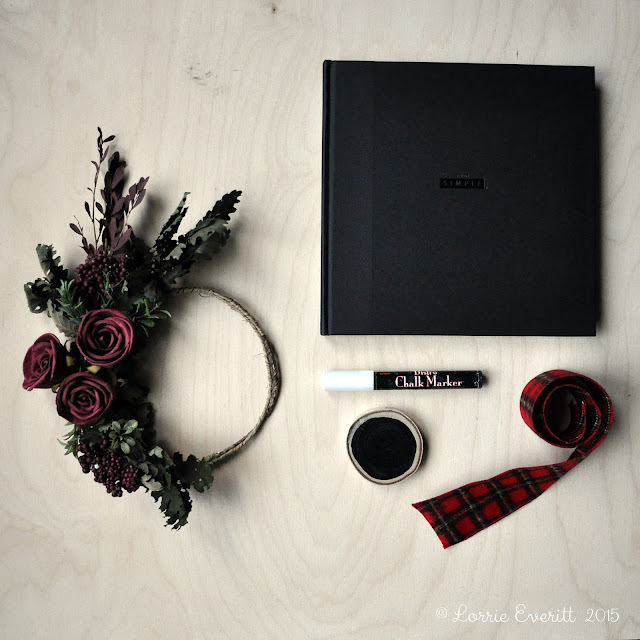 So this month I am going to write a few posts about how I am wrapping my Christmas gifts. This weekend I started to wrap a few of my family's gifts. I have not finished holiday shopping yet but I always feel like I'm ahead when I get a few gifts wrapped up and under the tree. I select my holiday wrapping supplies early and try to co-ordinate everything. This year it is all about kraft, black, gold and a touch of white to match my contemporary woodland theme. One of my favourite time savers for gift wrapping is to use plain gift boxes that are already "gift ready". All that I have to do is add some pretty ribbons and a few embellishments. Top left: This kraft box was decorated with ribbon. 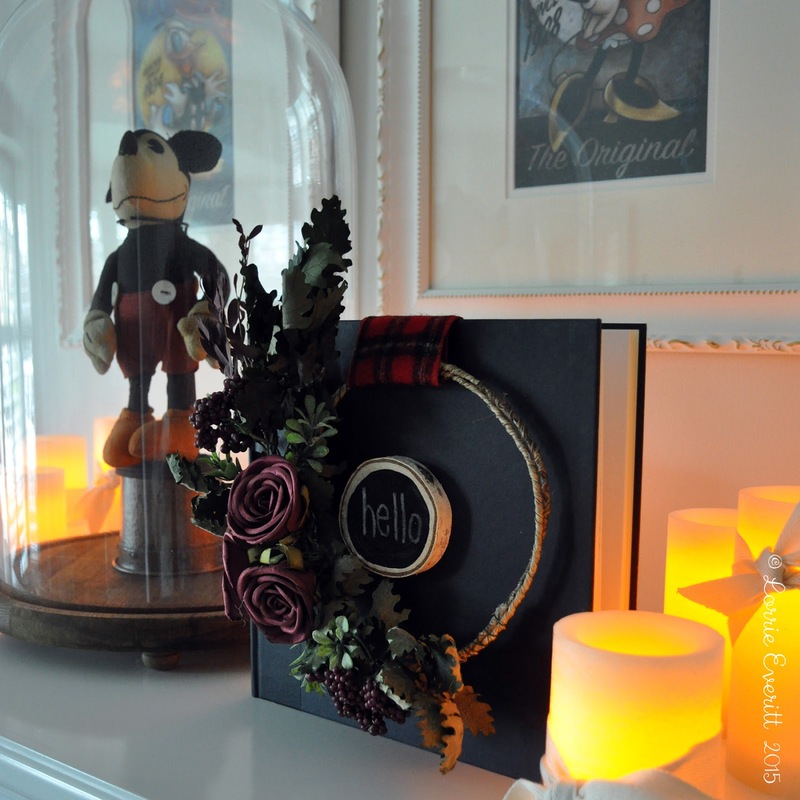 I added some artificial greenery and a gift tag that I created from a photo. Top right: A wrapping paper band was added to this box using two sided tape. 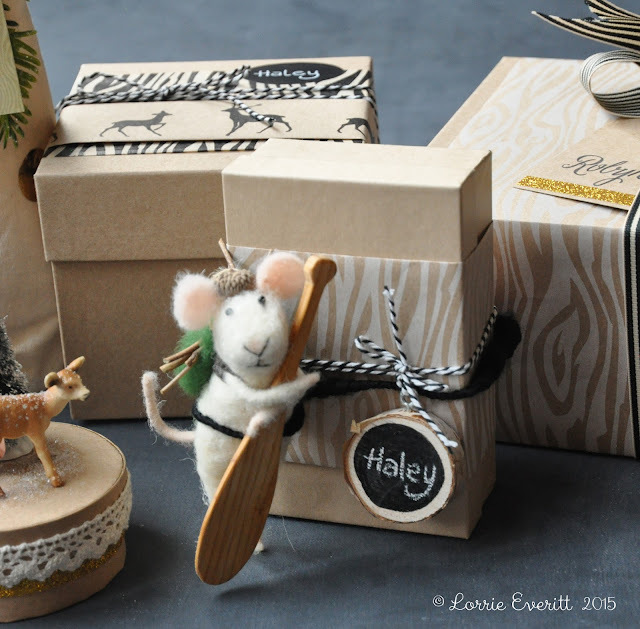 I purchased the felt mouse ornament and made the wood chalkboard gift tag. 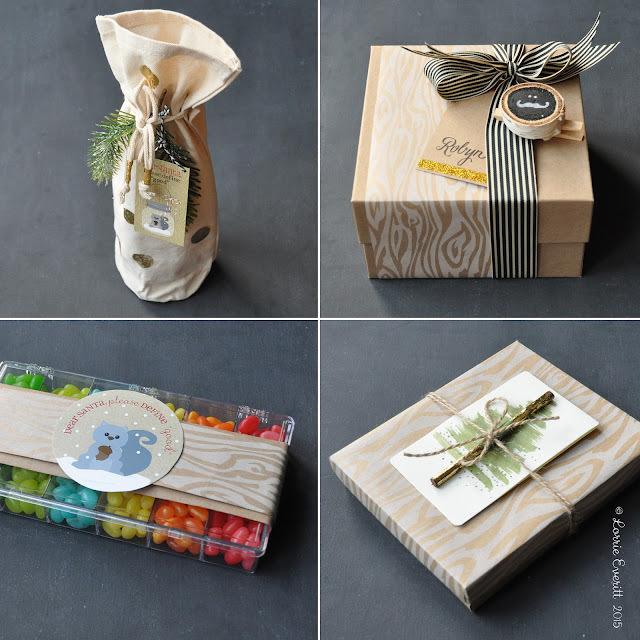 Bottom left: Round boxes make great gift boxes and can easily be decorated using glitter, washi and lace tape. 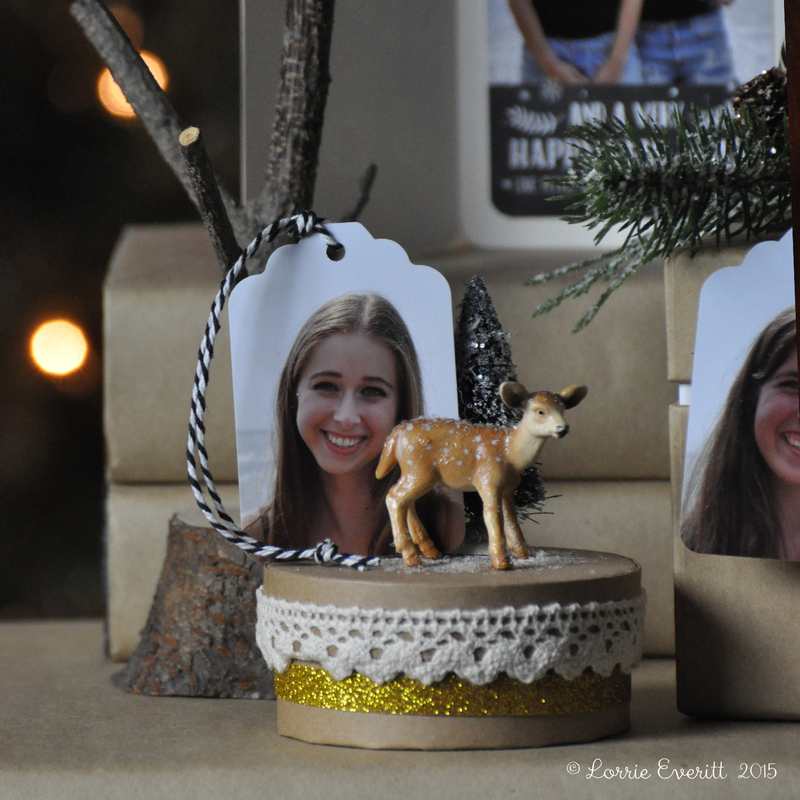 The toy deer and mini tree were glued into position on the top of the box so they could hold a photo gift tag. Bottom right: These gold and kraft boxes are my favourite because the gold glitter does not come off ... less mess = less time cleaning up! Ribbon does double duty here - it keeps the box from opening and it holds the fox bookmark in place. Plain kraft tags are dressed up with ribbon and a hand written message. I adore wrapping paper but I really don't like to wrap presents in the traditional way. So if I use gift wrap I usually try to do it in a way that will look "professionally" wrapped ... but it's not. Top left: Gold foil dots were added to plain canvas bags. 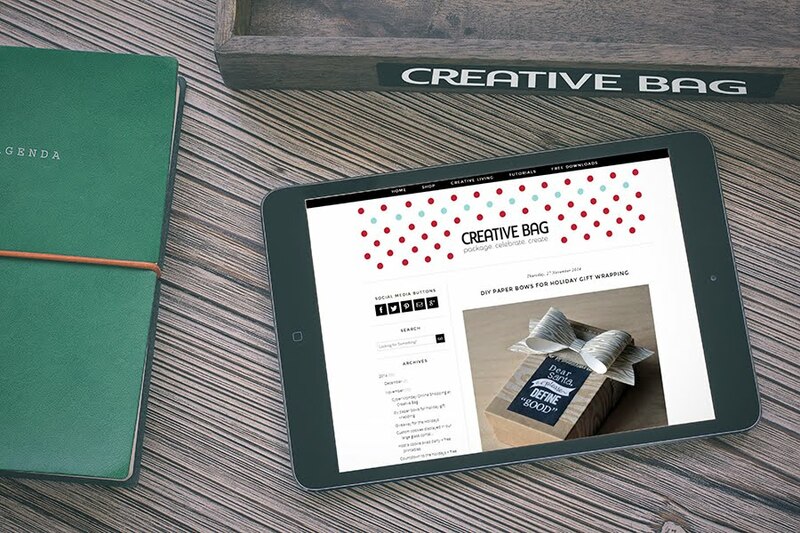 I created this diy wine bag project for She Entertains' holiday 2015 online magazine. Top right: I reuse these kraft boxes every year for my family's gifts. 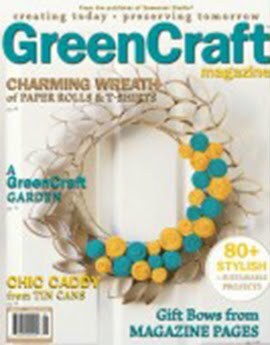 This year I'm adding patterned kraft wrapping paper and striped ribbons to decorate them. I glued one of my handmade wood chalkboards to a large clothespin to hold a kraft tag embellished with gold glitter tape. Bottom right: I only wrapped the top of this kraft box with wrapping paper so it could be reused. 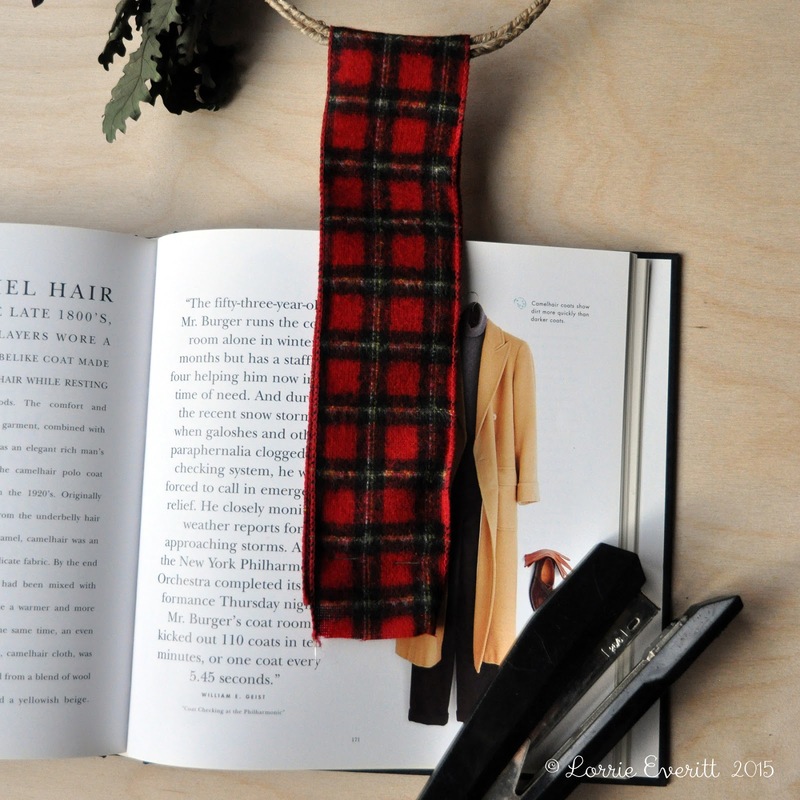 My gift tag was something that I received from Anthropologie last year and never used - they would be easy to recreate and I'm going to do a post later on to show you how to make these yourself. 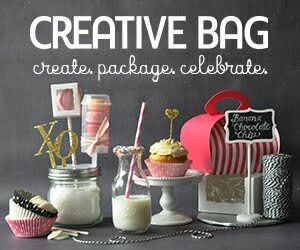 Bottom left: This is a simple idea for a hostess gift that I created for Creative Living online magazine last year . Use these clear boxes and fill them with candies from the bulk food store. I added a couple of bands of wrapping paper and a cute label to finish. You can find my free download for the label here. 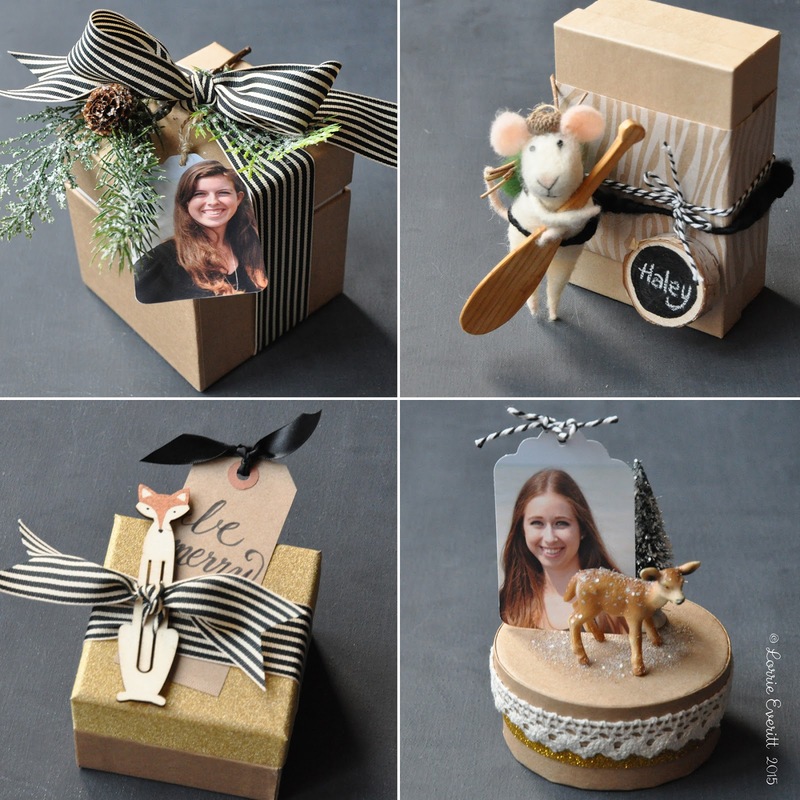 Now that I'm (finally) on Instagram, I'll be sharing my gift wrapping ideas there too! Have you started your holiday wrapping yet? 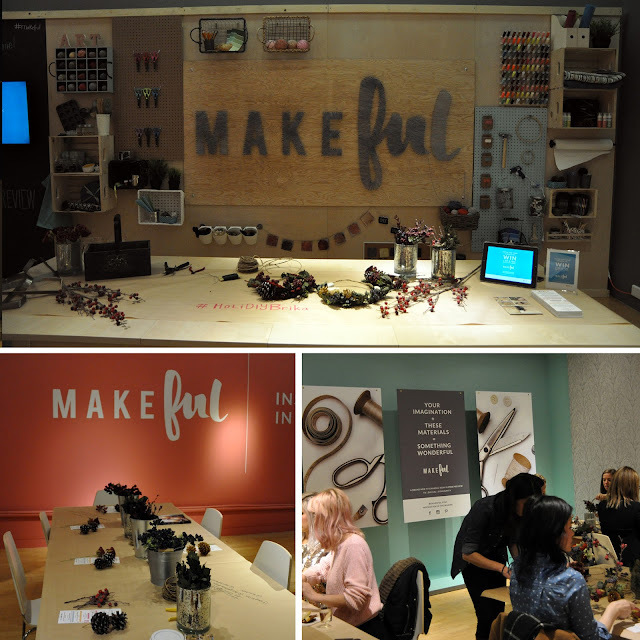 Last week I was invited to attend a workshop at the Makeful learning centre in BRIKA's Yorkdale popup store. 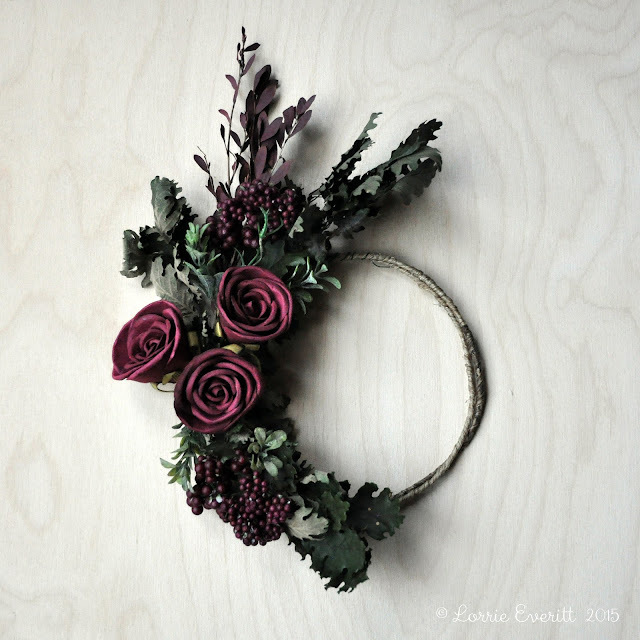 The whimsical wreath workshop by DeLight Floral Design and My Little Secrets was fabulous. The supplies on hand were beautiful and everyone's wreath was truly one of a kind. This photo was featured on BRIKA's Facebook page. My wreath (and hand) is on the left. Isn't the wallpaper in the background adorable! 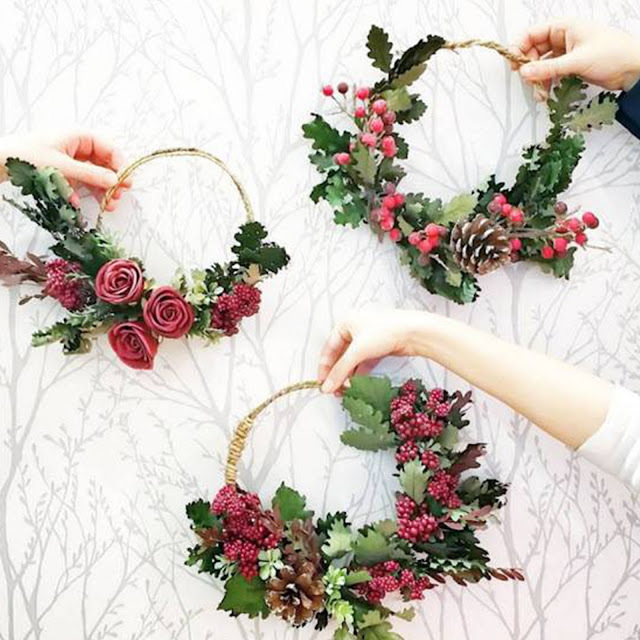 I don't have space to hang seasonal wreaths in my home so I knew when I was creating my project at the workshop that I would have to do something a little more with it when I got home. So the next day I gathered some supplies and figured out a way to display my whimsical wreath on the fireplace mantle using a hard cover book. 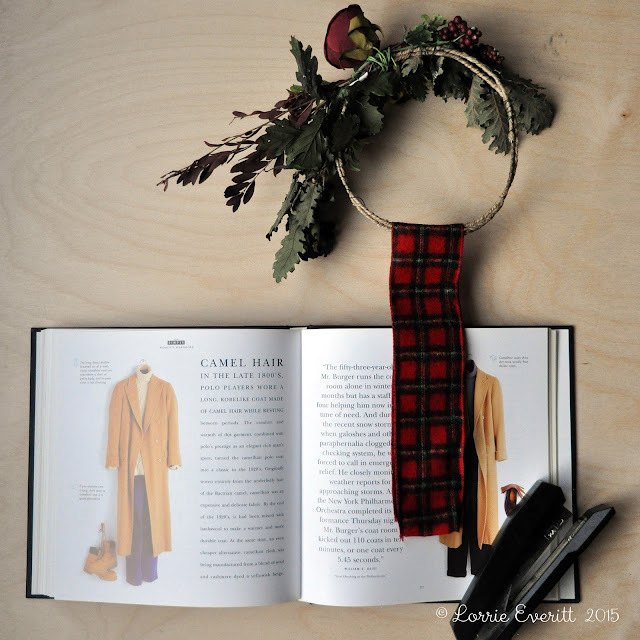 I had a plaid flannel ribbon scrap that was too small to tie as a bow but it just big enough to hang the wreath in place on the book. I folded the ribbon in half and looped it around the top of the wreath. Then I simply stapled the ribbon in place to a couple of pages in the middle of the book. 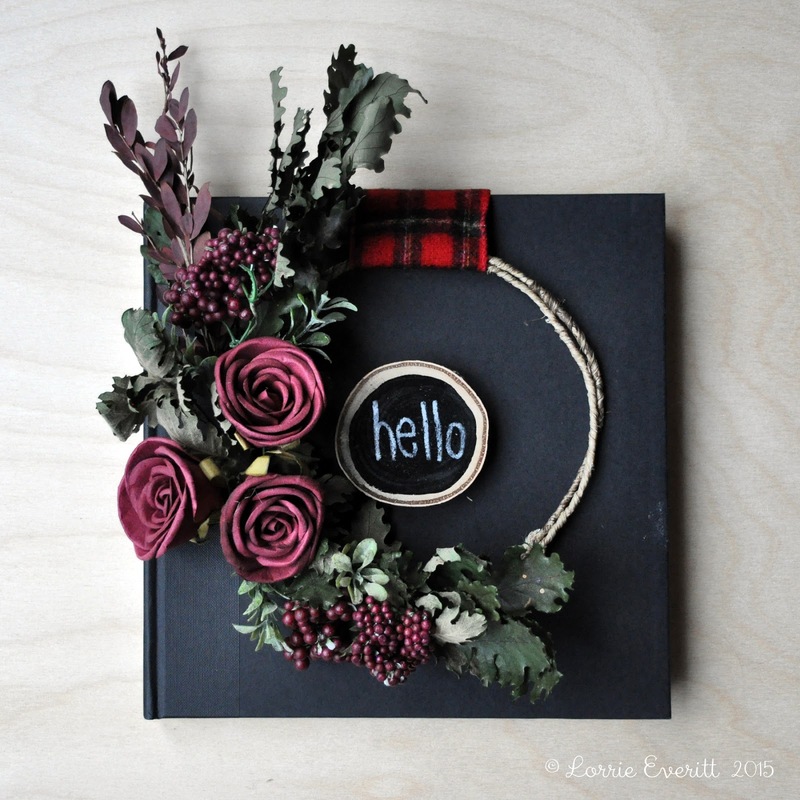 The book had an embossed title on the cover so to cover it up and add little something extra to my wreath I glued a birch wood slice that I painted with chalkboard paint. I thought about writing a holiday message using chalk markers but my "hello" message will allow me to display my wreath well into the new year. If you have a crafty friend and you're looking for a fun evening to get your craft on you really need to check out the workshops at BRIKA. These are some of the pics that I took at the BRIKA Yorkdale popup shop. 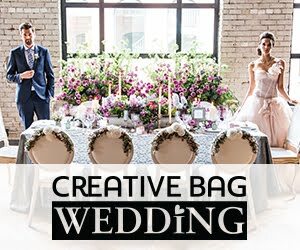 If you like to buy handmade ... this is the place to be. There's a great mix of products by some very talented artisans. I loved the cafe and just past the cash desk is a diy area that you can gift wrap your purchases. It's brilliant! The Makeful learning studio at the very back of the store is like a crafter's dream come true. The studio set up is so inspiring. Makeful is a new lifestyle TV channel that is all about celebrating the creativity within all of us! 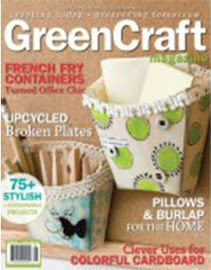 Whether you are into food, design or diy they have it all and it's in free preview right now. You can find out more about Makeful and the Makeful community on their website. Our family holiday entertaining plans are underway and I've already started marking dates on the calendar for holiday parties we have been invited to attend. 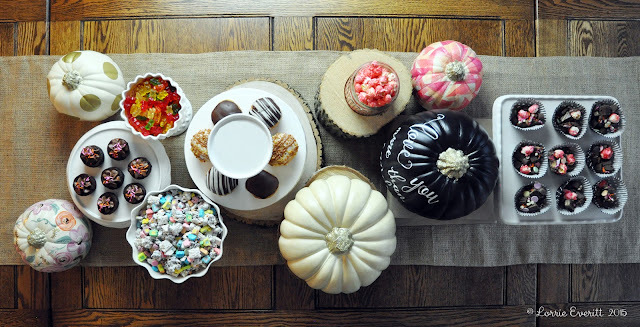 That had me thinking about what to do about hostess gifts. I always try to give something that is practical, reusable and unique. And if time is not an issue, I always try to add something that I've created myself, even if it's just the gift tag!! Last year I created these adorable hostess gifts and I thought that I'd share them with you for some early holiday gift giving inspiration. 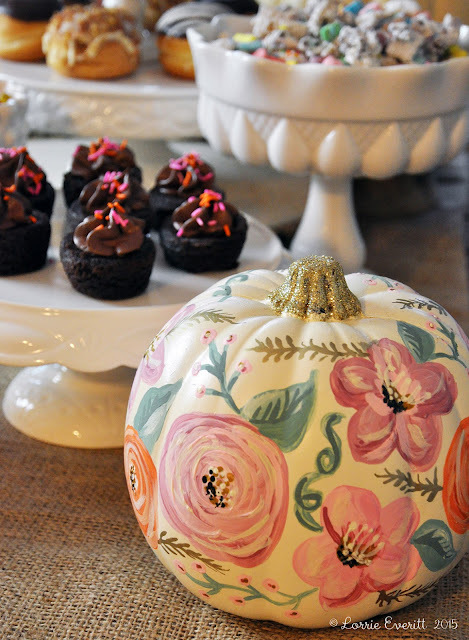 I purchased large glass containers and filled them with beautiful decorated cookies. The containers will look like snow globes when you add a little course sugar to keep the cookies in place. I attached chalkboard tags that I decorated with chalk markers on with twine to the glass lids. The cookies can be eaten (right away or saved for another day), the glass containers can be reused, and this gift is sure to make someone smile when you walk in the door. Best part about this hostess gift is that it is so pretty you really don't need to wrap it up which will save you some time. If you are a baker and can make your own cookies that's awesome! Or you can do what I did and buy cookies from a local bake shop or custom cookie maker. My cookies were custom made for me by Branded Bites. Branded Bites used some of my illustrations to created my cookies. Just remember if you are looking to have custom cookies created you may need extra time to order them at this time of year. And here's one of my favourite hostess gift wrapping ideas! Place two stacking boxes on top of a cake stand and tie them all together using a wide ribbon. Add an ornament to finish and you're done. The boxes could be filled with homemade baked goods or whatever you want. You can find more of my holiday ideas from last year here. 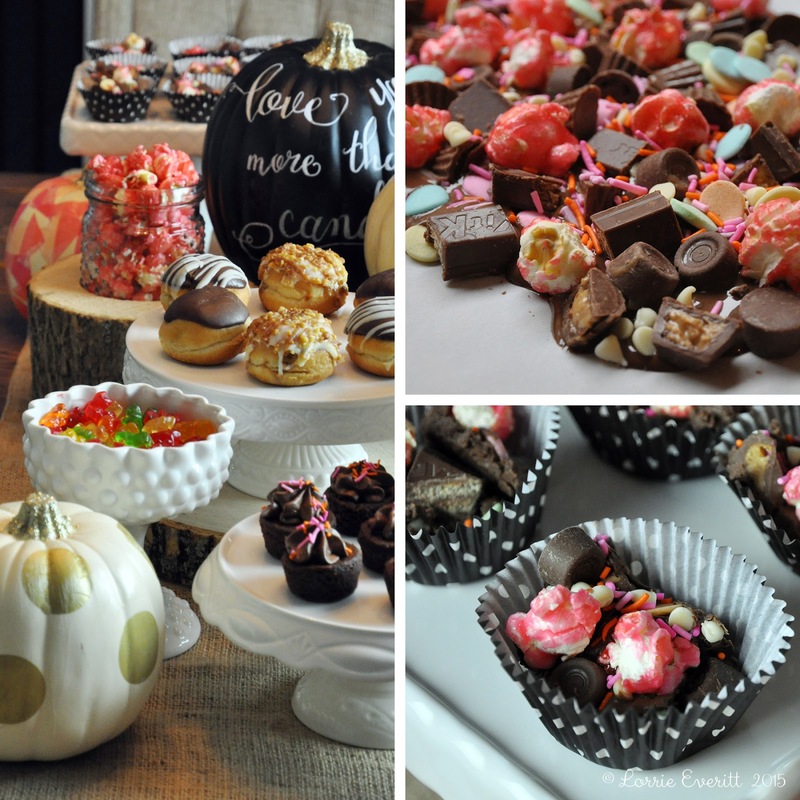 Are you hosting a Halloween party this weekend? 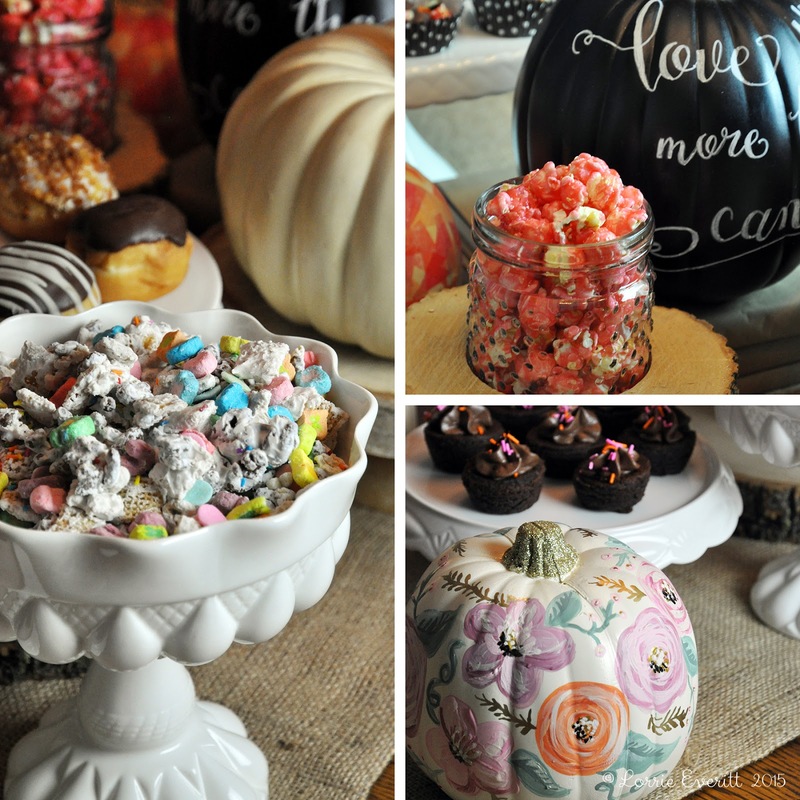 Here's a few of my tips and tricks for setting up a Halloween sweet table. Tip no. 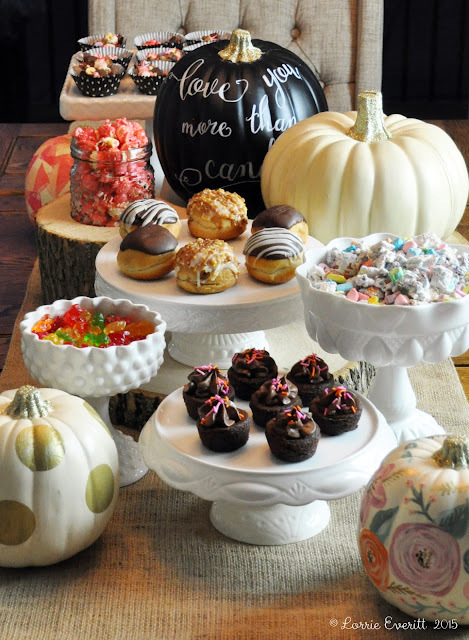 1 - It's okay to use an assortment of different containers and cake stands to display your treats. If you are going to use coloured dishes just try to keep them all to one colour so that the colours of the treats will take centre stage. Tip no 2 - Keep your treats simple and don't stress about having to make everything yourself. 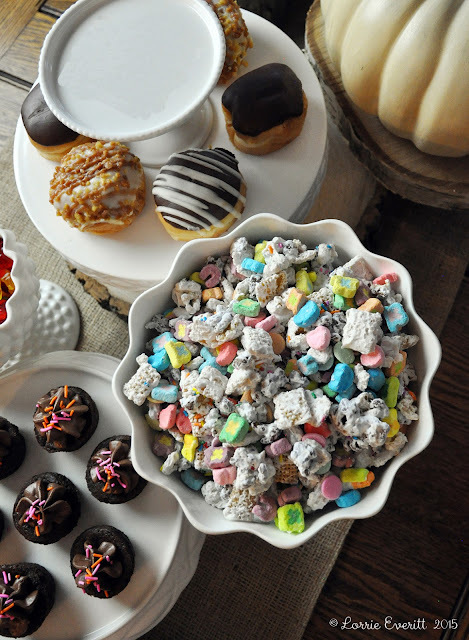 I used a combination of store bought treats (donuts and two-bite brownies) and combined them with some easy to make treats (candy bark and a chocolate covered cereals) and bulk food candies (gummy worms and candy covered popcorn). 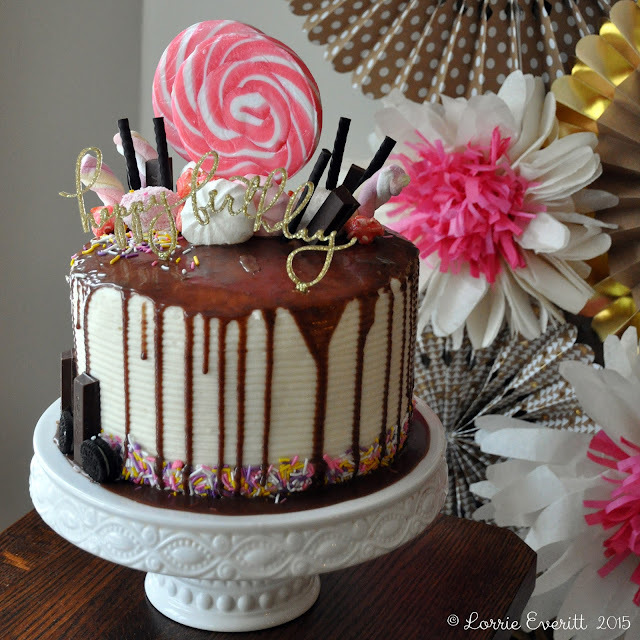 The candy bark was so easy to make using melted chocolate and assorted candies and sprinkles. 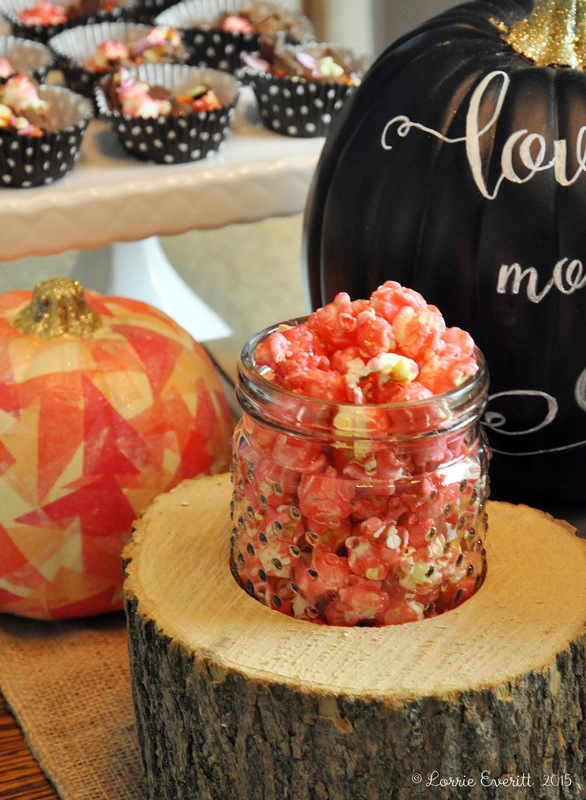 I was inspired to make my candy bark after reading the recipe in SheEntertains magazine. Whenever I don't have time to make brownies I buy one-bite brownies and decorate them with store bought cake icing and sprinkles. Everyone just assumes that I made them myself. Trick no. 3 Use some Halloween decorations in your set up that work with the colours of your treats. I added pumpkins that I decorated! Tip no. 4 - Try to elevate some of your serving containers so that everything is not at the same height. I used a few wood slabs in my set up - stacks of books or set up boxes will work too. 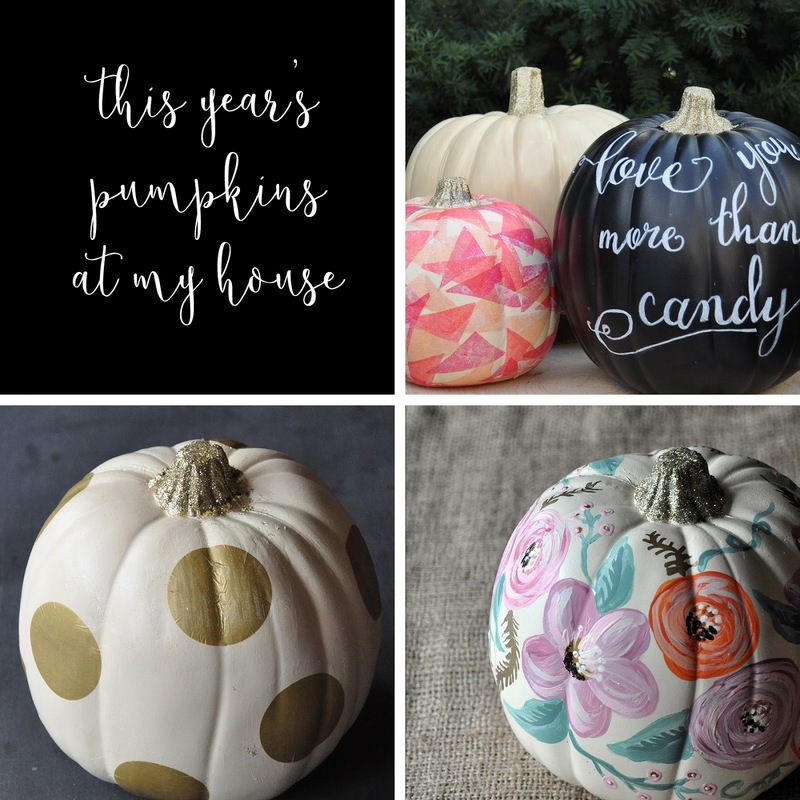 I decorated a number of pumpkins this fall using paint, glitter, tissue paper, chalk markers and gold paint markers. You can see some of them here and on Instagram. 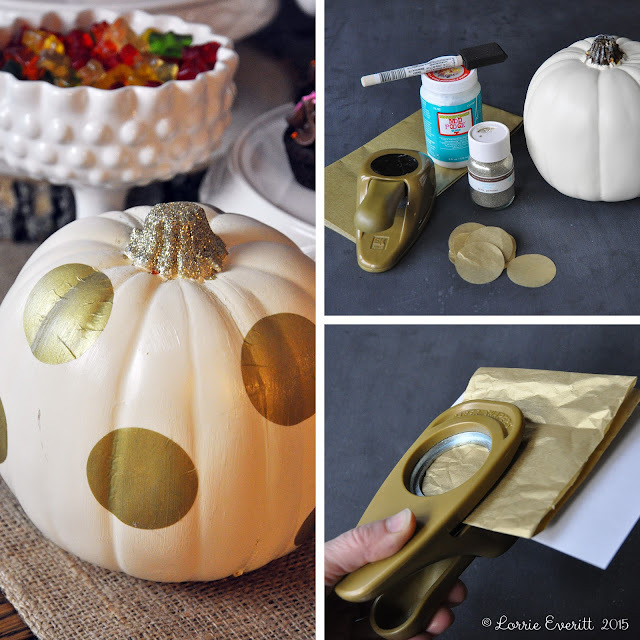 The gold polka dots on my pumpkin were created with gold tissue paper and mod podge. It took me less than 15 minutes to decorate the pumpkin and all of my polka dots are the same size! Here's a quick tip for cutting perfect tissue paper circles - use a paper punch! I find that it is easier to punch three or four sheets of tissue paper along with one sheet of text paper. I hope that your weekend is boo-tiful.